Enjoy the freedom to turn your portable easel into a dry erase board. 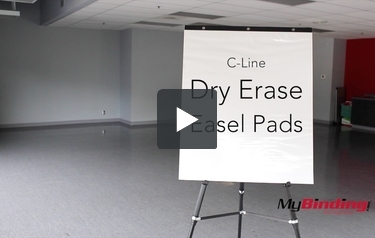 The C-Line dry erase easel pad sheets are capable to fit into any standard easel. The pre-drilled 3-hole ensures the pad stays secure during your meeting or presentation. Each pad contains 10-30 x 25 sheets, allowing for a more visual display. The dry erase easel pad is the idea product even for home schooling environment. Insert Size: 17 x 24"
This is C-Line Dry Erase Easel Pads! Nobody wants to be sad during a presentation, so Flip that frown upside down…and use this easel pad. In fact you can flip it ten times, as there is ten perforated dry-erase sheets! And on the back is a sturdy cardboard. Like I mentioned it is dry erase, which means you can wipe away everything when using the appropriate markers. And now I will point out that you can very faintly see the drawings on the page behind. It has three holes at the top for easy hanging with certain easels, though actually not with the one I am using here. And here is something they didn’t tell you, on the top back of every sheet is an adhesive strip. Tear off the page and peel off the adhesive cover and you can hang it on any flat service! Now you can impress with this dry erase pad.